Event production company A Current Affair (ACA) has won two new contracts - one from vodka brand Zubrowka and another from data firm Colt Technology Services. 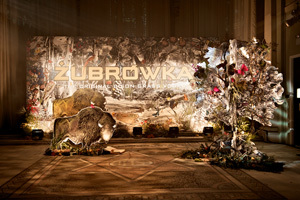 Following a four-way pitch, ACA was awarded the contract by Zubrowka-owner First Drinks and is charged with conveying the brand’s heritage and new visual identity through activity including experiential aimed at trade and consumers. ACA worked alongside design agency Purple Creative to win the business, while artist Kristjana S Williams was brought onboard to create the bison grass vodka brand's visual identity. Meanwhile, ACA has signed an events contract with and joined the roster of Colt Technology Services, having worked with the firm for a year. The agency becomes one of Colt’s preferred suppliers to deliver events over the next few years. Adam Goodman, founding partner of ACA, said: "Having worked with Colt for the past year we are delighted to be formally appointed onto their roster and with Deeper Blue, our partner agency, onboard we look forward to working closely with Colt over the coming years and building and developing our existing relationship." Jason Sullivan, Colt’s events and sponsorship manager, added: "When searching for the right agencies, we looked for a partner with whom we could work with that could not only offer the experience and expertise across the broad communications disciplines, but also one that would help us in our aim of bringing our brand values and vision to life, and support our position of being Europe’s leading information delivery platform. "ACA, with Deeper Blue, have the credentials and scalable skill-set to support us on our future communications journey."